It is a common touraco with long crest of about 8 to 12 cm length. Schalow’s Touraco adult male has green plumage overall. Wings are dark green, with crimson primary flight feathers. The long tail is dark blue to purple. Underparts are slightly paler green, including the undertail feathers. Head is green and shows a long pointed crest. This green crest is white-tipped. The short bill is red. Eyes are dark brown, surrounded by broad, bare, red eye-ring. We can see a white stripe from lores to the eye. Under the eye, a black line starts from the lores and underlines the eye. A last narrow white line passes under this black line. These lines give an impression of heavily made-up eyes! Legs and feet are dark grey. The Schalow’s Touraco utters hoarse “kow-kow-kow-kow”. The alarm call is a softer “krrrr”. Usually, this species utters a variety of croaking, barking or snarling calls. Schalow’s Touraco lives in forests and humid woodlands, from 600 to 2500 metres of elevation. It prefers fairly open woodlands and gallery forests. Schalow’s Touraco is sedentary in its range in Angola, Botswana, Democratic Republic of the Congo, Kenya, Malawi, Namibia, Tanzania, Zambia and Zimbabwe. 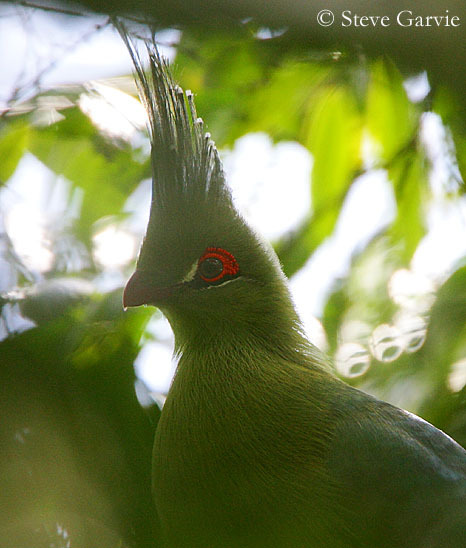 The Schalow’s Touraco feeds primarily on fruits and berries. It is mainly an arboreal species which occasionally comes down to the ground for bathing and drinking. It spends the most part of the day feeding, with preening and resting intervals. It rests during the hottest moments of the day. They sleep at night at communal roost, usually in tall leafy trees. Schalow’s Touraco is strongly territorial. The members of the family remain in groups for long time. Forest touracos live in territorial pairs all year round, and defend strongly their territories. The family groups may travel long distances, in order to find a particular fruiting tree. They approach or leave it in single file and silently. The courtship period starts with the rainy season. Birds call, chase each other from tree to tree, and perform mutual courtship feeding, display of the crest and head colours, bowing, flicking tail, and they also spread their wings in order to expose the crimson primary flight feathers. The Schalow’s Touraco, as other touracos’ species, is rather a poor flier. However, it is able to move through the canopy with great agility. When it takes off, it performs a short downwards glide, and some rapid wing beats to the next tree. Then, it moves by climbing and with short hops and bounds into the branches. It is able to take flight readily, and to travel long distances with strong, buoyant flight. 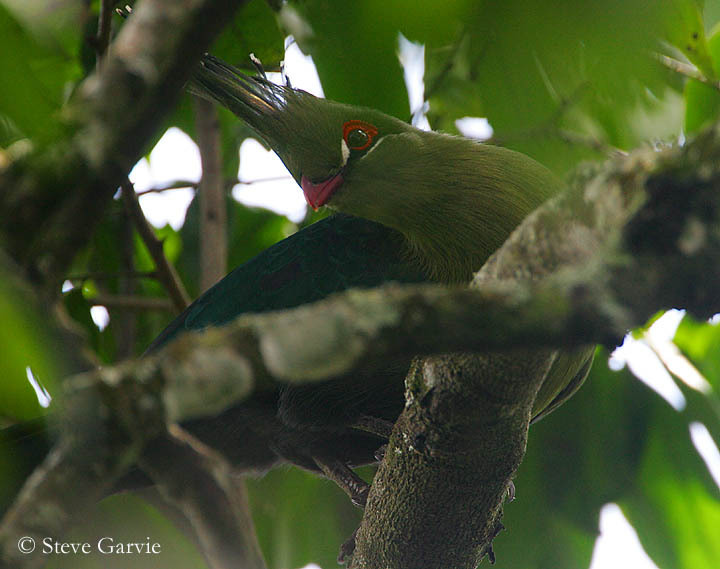 Schalow’s Touraco’s nest is usually a flat, loose structure made with sticks and twigs, and situated at about 3 to 10 metres above the ground. It is placed in tree or bush, among the thickest parts of the vegetation. Female lays two white to greyish-white eggs. Incubation lasts about 20 to 22 days, shared by both parents. The chicks are fed by regurgitation by both adults. Young are able to leave the nest about 2 to 3 weeks after hatching. They remain in the branches around the nest, until they can fly, at about 4 to 5 weeks of age. They depend on their parents for long time after fledging, during several weeks. 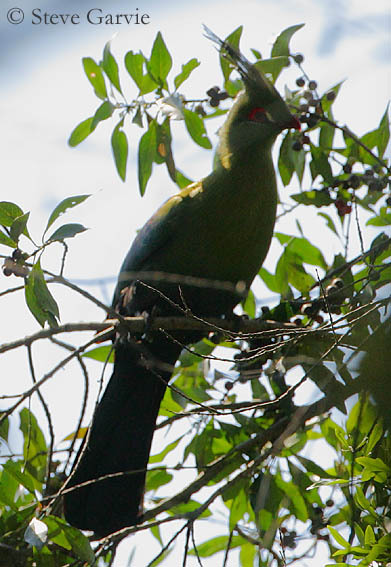 Schalow’s Touraco feeds mainly on fruits and berries, wild or cultivated items. It is vegetarian, and also consumes some flowers and buds. During the breeding season, it may take caterpillars, insects, snails, slugs and termites. Schalow’s Touraco is relatively common in its range. Predators at nest are mainly raptors, but monkeys and snakes also take the eggs or attack the chicks. However, this species is not threatened at this moment.